This is an authentic Native American cedar flute with an intricately hand carved mountain lion wind block. Made in the USA by Native American Navajo artist Jonah Thompson, this flute is appreciated by experienced players and beginners as well. This Native flute measures 22.5″ long and is a standard 6 hole flute in the key of F#. For those desiring a high quality flute, this will provide hours of enjoyment and peaceful relaxation. The finger holes are well spaced for beginners because the separation is not far apart like on most larger flutes. This is a perfect choice for both men and women. 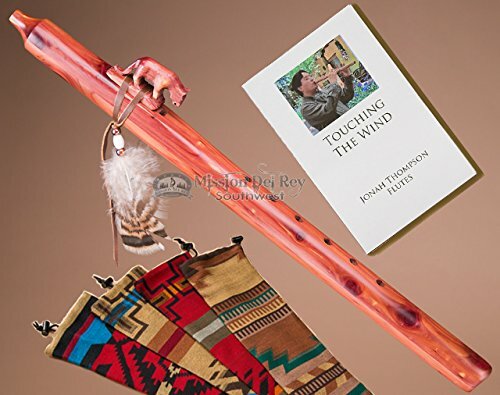 ***Included is Touching the Wind, an introduction to Jonah Thompson flutes and a genuine Native pattern woven draw string flute bag, similar to one shown. FAST Priority shipping with tracking, leaves our warehouse the same or next business day.